Shadows from the past. A brutal murder. This time it's personal. It takes only one phone call to turn Harry Starke into a monster. It begins when Harry's kid brother is brutally murdered, his body thrown into the murky waters of the Tennessee River. That alone would be enough to set Harry on the warpath, but less than 24 hours after the body is found, Harry finds out there's a bounty on his head, too. $25,000. His answer? Strike first and strike hard. And so it begins. Harry and his army of three must go up against old enemies, but they face almost insurmountable odds when they go looking for retribution. What marks the Harry Starke books above many a P.I. series is that each book is so different to the other. There’s nothing run of the mill about this series, it never gets stale, and in this book we see yet another side of Harrys complex character. “Retribution” begins with so much happiness, Harry, August, his father, Rose his stepmother and Amanda his fiancee are at the country club. Rose pushes Harry and Amanda for a wedding date, Harry surprises them all with not only a date, but also, actual wedding plans. A great celebration is arranged and everyone is over the moon. Not for long though, when Harry is told the terrible news of his brothers death he puts life on hold. He vows to find the murderer. His quest for retribution results in his life and the lives of his family and staff being put in great danger. To avenge his brothers death Harry and his team of two face seemingly impossible odds, there is a lot of gunfire and there’s violence aplenty. What follows is a dangerous, exciting and nail biting adventure. How the heck does he get out of this one? Yes, there is a lot of violence in this book but it is balanced out with some tender and moving moments as the family bonds are strengthened in their time of grief. Narrated by Tom Lennon who, once again, succeeds in bringing Harry and all the characters to life. Most audiobook fans agree that a good narrator adds an extra dimension to a story thereby making it that much more enjoyable, and Tom Lennon excels in doing just that. Top job Tom! This is by far one of the best books I've ever read or listened to. It was beautifully written and artfully read, but most importantly, it was as if It was speaking right to my heart! I can't stop recommending this book to everyone I know! I received a free copy of this book and voluntarily decided to review." Crime stories and private eye novels are not what I usually listen too, but some thing about the blurb caught my attention , so I thought I'd give this audiobook a try. I'm glad I did! Yes there's violence and death, but there's also humor and characters that you truly like and root for them to make it out alive! What I like most is there's no gratuitous violence and while Harry Starke is a deadly man, it's clear he doesn't relish killing anyone and doesn't take it lightly. This is the seventh book in the series, but the first that I've listened to and if I feel for the characters after 6 hours, I can only imagine how I'll feel after listening to the rest series! which I will definitely be doing! The audio quality wasn't the best, but that's the only issue I had with this book and it's a small one. This audiobook was given to me to me at no cost in exchange for an unbiased review, thanks Audiobook Boom! Look No Further for Great Action Thriller Series! Would you consider the audio edition of Retribution to be better than the print version? I haven't yet read the Kindle edition. It's a heck of series voiced by Tom Lennon. Distinctive unique voices for characters and a sense of both timing and suspense that make the audio book near the top of my library for the action genre. What other book might you compare Retribution to and why? I have listened to Book One in the series. This continues a great series. In my opinion, the character is or will be as iconic as Jack Reacher. A go-to series for just good entertainment and action. It's a established series with many fans too. Which character – as performed by Tom Lennon – was your favorite? Harry Starke. There is a fit between the character and Tom Lennon's presentation of Harry. As well as each of the other individuals. I much appreciate the chance to listen to and review this Audible version of Retribution Book 7 of the Harry Starke series! Thank you! I'm just wild about Harry. Thank you Blair Howard. I loves the way each scene is described to the utmost detail. I feel like I'm right there. I did a quick perusal of other reviews for this title so I'm aware that my review will be in the minority. This is my first Harry Starke novel and perhaps I'm coming too late to the party. I was expecting something with the grit of "RC Bray" and got the less intensive sounds of someone similar to "Garrison Keillor." It was initially very disconcerting. I stayed with the story because I really liked it but as much as I liked the story, I disliked the narration just as. He was great but never sounded much like the take-no-prisoners kind of guy that I heard in my head. Totally personal. "and we take it fast - and hard"
What made the experience of listening to Retribution the most enjoyable? 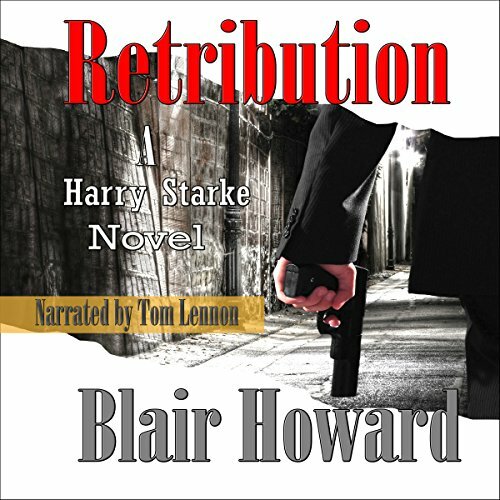 When I first received, via Audiobook Boom, a complementary copy of Retribution to review, I had not previously read or listened to any in the Harry Starke series. This could have been problematic as many long running series depend upon earlier volumes to build character development and background. And this was number seven! I needn't have worried. Very early in the book, Harry emerged as a fully three dimensional, believable person with all relevant history attached. This was enhanced by Tom Lennon's narration. With his calm, pleasant, somewhat legubrious reading, he became the voice of Starke. I was also expecting, from the brief accompanying book blurb, an action packed shoot-'em-up pursuit thriller with a vigilante loner out for Vengeance following the death of his brother. Well, partially right. This is certainly a thriller, Harry's brother is murdered and there is a (big) shoot out. But it's far more than that. It is also thoughtful, sometimes emotional. And Starke is not a loner. He has friends .. This is an above average book, well written, with tension and action, great characters, a fine narration and guns. Lots of guns. I learned some interesting facts about guns. So if you haven't yet met Harry Starke, give this book a try. I doubt you'll be disappointed. If you are familiar with him already, well, you know this will be good.